Anthropologists believe that the tradition of an engagement ring originated from the Roman custom of women wearing betrothal (truth) rings. These rings were given as a sign of friendship or affection, and they did not always represent the rite of marriage. These early rings, often formed from twisted copper or braided hair, were worn on the third finger of the left hand, as Romans believed that a vein in the third finger (vena amorous) ran directly to the heart. The custom of giving engagement rings disappeared sometime during the Dark Ages. It was later revived in Europe in the 13th century, only two hundred years before Maximilian added that expensive diamond. 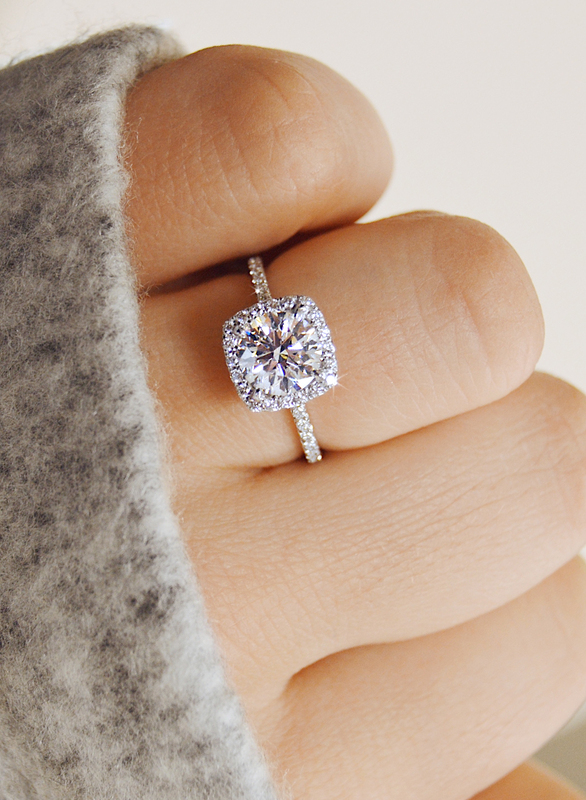 What many people now consider to be the sentiment of the engagement ring began in 1215. Pope Innocent III, one of the most powerful popes during the Middle Ages, declared a waiting period between a betrothal and the marriage ceremony. The rings were used to signify the couple’s commitment in the interim. It was around this same time that rings were introduced as a major component of the wedding ceremony, and it was mandated by the Roman government that all marriage ceremonies be held in a church. Along with serving as symbols of one’s intent to marry, these early rings also symbolized social rank. Only the “elite” were permitted to wear ornate or jeweled rings. In 1477 the Archduke Maximilian of Austria, proposed marriage to Mary of Burgundy with a diamond engagement ring. It was made of thin, flat pieces of diamonds in the shape of M.
The sentimental Victorians popularized ornate engagement ring designs that mixed diamonds and other gemstones with precious metals and enamels. Often these rings were crafted in the shapes of flowers and were inscribed inside with poems or love messages. These “posy rings” were a Middle Age invention and continued to be popular through Victorian times. Sentimental inscriptions inside wedding bands still endure to this day. Diamond rings crafted during the Edwardian era continued the tradition of pairing diamonds with other gems, commonly mounted in a filigree setting. In America, from colonial times through the late 19th Century, men gave their betrothed a tumbler customarily used for sewing. The bride cut the top off and used what was left as a ring. In 1870, a plentiful supply of diamonds was discovered in South Africa. This, along with the wealth produced during the Industrial Revolution, made the diamond accessible and affordable to the mass public and diamonds quickly became the engagement ring gemstone of choice. For many years, the most popular cut for diamond engagement rings has been the round brilliant cut consisting of 58 facets that divide the stone into a top and bottom half. The round cut is followed by the cushion cut and emerald cut in terms of popularity. Less than 5% of all diamonds produced meet the brilliance, cut and value standards demanded by Ascot. We are proud to offer only the ‘best of the best’ diamonds from around the world. Ascot’s mission is to provide excellence, knowledge and value in a dignified atmosphere where clients make informed decisions without sales pressure and enjoy this special time in their lives. We invite you to visit Ascot Diamonds in New York, Dallas, D.C. or Atlanta to begin your diamond engagement ring history.